It can sometimes be too easy for brands to fall into the played out and cheesy route with their Valentine’s Day marketing and ad campaigns: sad, single people crying into their cold takeout, happy couples gliding off into the sunset because he “went to Jared,” and love-hungry people swooning over roses and chocolates. Luckily, many brands and their agencies have realized their consumers are looking for real and witty campaigns, and have started to think outside of the heart-shaped chocolate box to craft unique digital and in-store experiences during Valentine’s Day. The key to a good Valentine’s Day marketing campaign is creating a connection between your brand and the consumer. Smithfield, knew exactly what they were doing when they developed the concept for and launched their Bacon and Ham Valentine’s Day eCard Creator ahead of the holiday this year. 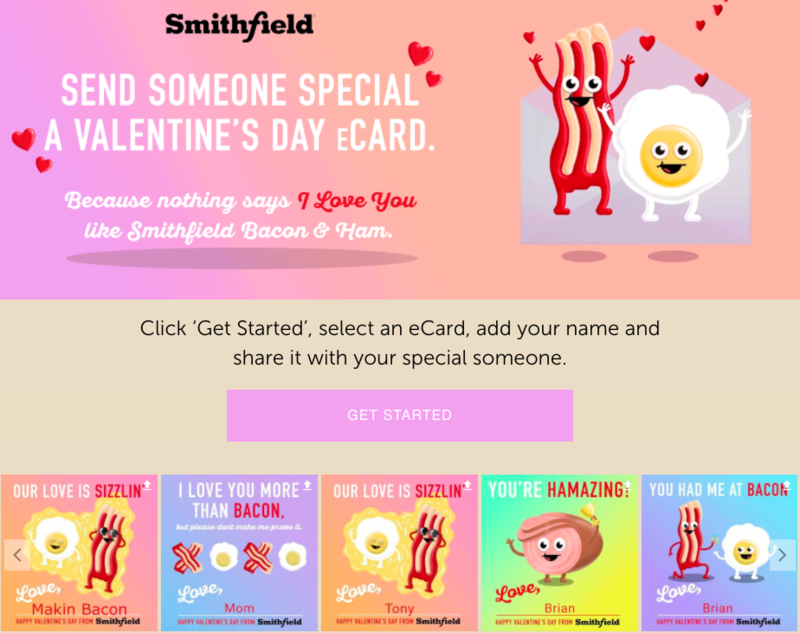 The Smithfield team ditched the classic Valentine’s Day clichés and created custom, shareable eCards that featured Bacon and Ham, instead of roses, chocolates and hearts. Their approach was a smart way to build buzz around their brand during a holiday that many wouldn’t associate with cured meats and breakfast foods and elicit customer engagement during an unlikely holiday for their brand. Smithfield’s DCI score will be a combination of an Engagement Score (ES) and a Virality Score (VS). The DCI is a real-time campaign scoring tool used at Wyng to gauge the effectiveness of both individual campaigns and overall digital campaign strategy. Check out some helpful tips below based on Smithfield’s creative Valentine’s Day campaign that you can incorporate into your digital campaigns to increase engagement and virality. Leverage technology to engage consumers. Smithfield made great use of the Wyng Platform and our eCard Creator to streamline the process for consumers to easily customize and then share their eCards with friends, family, or strangers. Keep it branded, but make it fun. Smithfield flipped the switch on what co-created branded content can be. They made the smart choice to design custom eCards that featured cartoon bacon, ham, and eggs, which all conveyed the spirit of the Smithfield brand without the new for large logos or brand-focused copy. A “punderful” shareable eCard solution. Worldwide, an estimated 500 million e-cards are sent each year, and we feel confident in saying a solid majority of those are sent on or around Valentine’s Day. By creating and hosting a selection of bacon and ham pun-filled Valentine’s Day eCards, Smithfield gave their consumers a fun way to celebrate their love for breakfast meats and the people that mean the most to them. Enable multiple options for sharing. Smithfield made a great choice by enabling their campaign participants the ability to share entries in one of multiple ways, including Twitter and Facebook, facilitating the share process and driving earned reach. Make sure to check out Smithfield’s Valentine’s eCard campaign here and don’t forget to share your own.